Volumetrics are the unsung heroes working hard behind the scenes of your espresso machine to make sure your yields are on recipe shot to shot. The button you push works by talking to a fancy doobybanger called a flow meter – a box which the water passing through, pushing around a little click wheel that has two magnets on it. Every time it rotates a ‘pulse’ is registered, and this is how the machine controls how much water gets through to your group. Why do you care about this, I hear you asking? A couple of reasons. Getting our volumetrics spot on will make a big difference to the consistency of the tastiness of your coffee. Sometimes they drift out and you may need to change them, other times you may be running different singles or blends with different desired yields. Pulling your scales up onto the drip tray for these special coffees is great, but getting the machine to do all the hard work for you is better! This can be a bit of a massive topic, so we’ve broken it down into three pieces. Part 1 is going to talk about checking your volumetrics, then parts 2 and 3 will look at how to adjust them for specific machinery. Checking your volumetrics is a twofold job – our volumetrics unfortunately don’t speak in grams of brewed coffee, or even mL/grams of brew water. Our flow meter uses pulses to determine water quantity which we then translate to either mLs or grams, and our final yield which is determined by the amount of brew water combined with dose and extraction time. Sound complex? It doesn’t have to be! We’re going to work backwards to make sure all these numbers are lining up and we’re hitting the flavour notes we want. The first step is brewing an espresso and checking the yield straight up. To do this, make sure your grinder is running as close to recipe as possible – dose to +-.1g and shot times within +-2 seconds. Tare your cup off on your scales and run the shot – weigh your yield after. We’re looking to be within +-1g of the recipe you’re gunning for – they can be found here. On spec? Great! Not on spec? Boo. Regardless of which camp you’re in we want to see if all the groups are correct or not, so we’re going to have to work out a way to check. You could repeat the above process, but it’s faster and less wasteful to just weigh your brew water weight. Go to the group you ran your first shot from, purge, then weigh the water coming from your volumetric button. Write it down. Now check the other groups and see if they’re the same! We’re aiming for +-1.5g to see that consistency. This will correlate to yields and save you a bit of a headache! Work out which group is in control. All La Marzoccos will copy the volumetrics from the left group to the others. This setting though is in pulses so it may not be correct – this will be a massive bummer if you’ve painstakingly set up your volumes from the right group. Always retare your cup – it’s pretty easy to not notice a gram of water sitting at the bottom or around the edges! On that, when you’re weighing your brew water make sure it’s done without the handle in the group. Those suckers can retain water and give you false readings! It’s been said before, but make sure your grinder is dialled in. A 24g dose will retain more water than a 21g dose, which means all that hard work may be in vain! For those of you brave enough to give this a go on your own, our machine specific guides can be found here for the PB and here for other LMs. 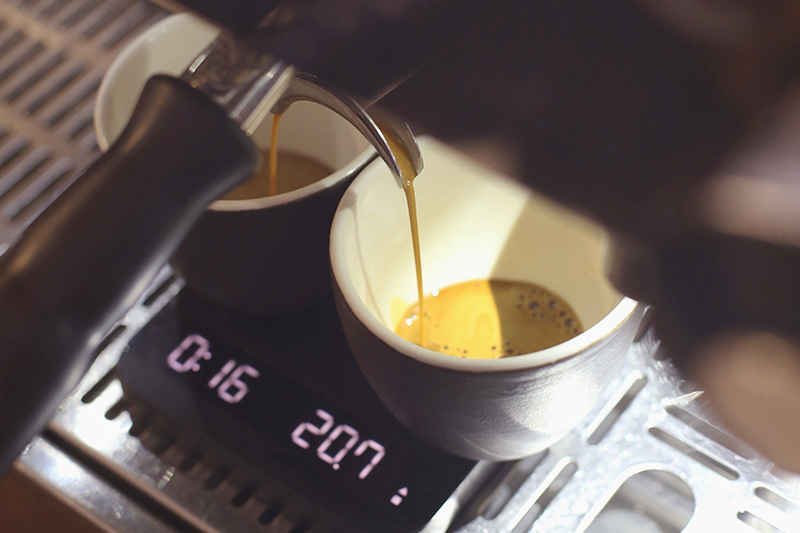 If you’re using something that’s not an LM it’s probably best to get in touch – but with that said a lot of the innovators borrow tech from LM (We’re looking at you, Synesso, Slayer, Kees Van Der Western etc) and will follow the same logic.